April is almost here, which means Spring is upon us – FINALLY! I’m so ready to be done with winter, that’s for sure. I’ve been having a great time putting up more bright, fun colors and decorating for the upcoming holiday. My newest edition is this adorable and super simple Easter Scrappy Banner! I’m sure I’m not the only one with fabric scraps filling up tons of my craft room, right? This is the perfect use for them! You can switch it up however you want, use your favorite colors or patterns, and just have fun with it. 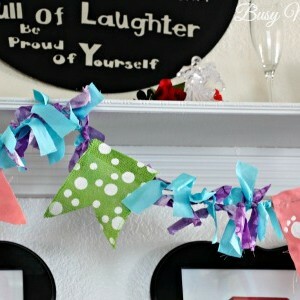 Cut out your banner squares (mine were the green polka-dot burlap and the pink-ish fabric), as well as your scrappy strips. For my burlap, I kept a small strip for attaching, and have TWO sides for my pink fabric squares. Cut triangles on the bottom of your squares. Get your long piece of ribbon/cord and lay it out so you can see how you want everything to fit. Use your hot glue gun to attach the squares – I used a strip on the back of the burlap, added glue, then stuck the cord between the two pieces. Same with the pink squares. Between your banner pieces, tie the scrappy strips to the cord. Use your puffy paint (mine is white) to carefully draw little bunny feet. Once this is dry, use a dot of hot glue to attach the pom-pom bunny tail. You’re done! Now just hang it up to get your home more Spring & Easter ready! I do wonder if I should’ve used a third color along with the scrappy strips, but I really love the way it looks now! The polka-dot burlap is one of my favorites about it…just so fun and really accents it perfectly. What colors would you use for YOUR Easter scrappy banner? I feel like I’ve been drowning in Pirate-themed madness the past month, but in a can’t-wait-to-see-what’s-next type of way! Now who’s ready for some amazing Pirate Party food, decor, crafts and the neatest Pirate thank you gift ever?! Oh, and don’t forget the Free Printables! I received free Lollipics to facilitate a review. All opinions are 100% my own. If you missed it, be sure to check out our Pirate Party: Party One for all the fun games and activities we did for Green Lantern’s 3rd birthday! I wanted to save the best for last, which means lots of food, decor, Free Printables and this AMAZING Pirate Thank You Gift: Lollipics! Aren’t those just the cutest?! I first met the crew from Lollipics at SNAP! Conference, and instantly loved their products. I mean, how cool is it to just upload any photo or graphic and have them create your very own personalized, handcrafted lollipop with edible images? SUPER COOL! Plus, they’re some of the nicest people ever….and came fully stocked with a mountain of Diet Coke for those bloggers needing a pick-me-up. I also fully support companies that provide quality products AND quality shipping. How often do you order something, and it ends up packaged half-properly? These guys take the time to put your tasty Lollipics into a very well packaged box, with more than adequate padding. Call me crazy, but I think any company that takes the time to make the PACKAGING look nicely done deserves two thumbs up! These Pirate Lollipics are one of their MANY stock images that you can choose from, if you don’t have a specific image of your own. And you don’t have to buy dozens of them…just a minimum order of 6! I used these as a fabulous Thank You gift for our party friends. Since we did a photo booth, the following week we printed their pictures and took them in an envelope with our cute printable, attaching their very own Lollipic for them to enjoy! You can connect with Lollipics and their amazing, tasty treats to join in the fun! Ready for more of our fabulous Pirate Party fun? Seaweed Wraps: we got spinach-herb tortillas (so they’d be green), then just did turkey, cheese and lettuce wrapped inside. Polly’s Crackers: crackers and cheese….simple as that! Salty Sea Water: blue Hawaiian punch bottles with the labels replaced. Although many of the games and activities served as decor, also, here are some of the other Pirate-y extras! We used our Chore Treasure Chest to hold our pirate swords, hats, and eye patches (all found on Amazon) next to our photo booth. We made our spy glasses using empty paper towel rolls covered with brown paper, then gold paper on the ends and semi-middle. Super simple, yet they STILL play with them like crazy! If you saw the boys’ Pirate Bedroom Makeover, you probably noticed this amazing Pirate Direction Sign. It was SUPER easy to make, and lots of fun! Tutorial coming soon…so stay tuned! I had to incorporate ‘X marks the spot’ somehow, so I used poster board to cut out a big red X on our front door, with black cut out ‘Ahoy Matey’ greetings! This is now on the boys’ bedroom door. I had so much fun with the printables for our Pirate Party, and even made some Pirate Booty signs to attach to their DIY Treasure Chests to take home! Ready for the Free Printables? I bet you are! Here’s ALL the fun signs and tags I did for the party…. It’s been almost a month since Green Lantern’s 3rd birthday, and I’m finally ready to share his Pirate Party with you! There was a quite a bit, so today I’ll be sharing the games and activities we did! Better late than never, right? After the party was over, I got so busy doing the boys’ Pirate Bedroom that I just let his Pirate Party sit on the back burner for awhile. I guess this way we have a couple weeks filled with Pirate fun, right?! Even with all the exciting stuff for his party, Green Lantern was in the wrong mood for a party that afternoon. We’d be like ‘time to open presents’ and our stubborn 3-year-old says ‘I too busy’! Seriously, what a pill! Once we convinced him to join in, though, he couldn’t get enough of the fun! We didn’t do a lot of complex activities at this Pirate Party, since it was geared towards 3-year-olds, but most of it can be changed up for any age level! It doesn’t get much more simple than this, but the kids thought it was a blast! Just get a long board (make sure it’s sturdy…don’t want injured kids) and something to prop up the ends on. We used some extra bricks. The blow up Tick-Tock-Croc was from Amazon (and came with rings for a toss game….see below what we used them for). I quickly colored stripes on a plain poster board, cut holes and stuck three hooks through (ordered on Amazon), and then used the rings that came with ol’ Tick-Tock-Croc for a fabulous game of toss. The youngest friends (under 2 year olds) hung out by this the majority of the time, putting the rings on, taking them off, putting them on….it was super cute! I found this awesome stick book at Walmart for a few bucks. It has a LOT of pages of pirate characters, then you use the included sticker sheets to make your own with eyes, noses, mustaches, skulls, and other pirate stuff! Some of the kids wanted their pirate to look ‘the right way’, others turned out quite unique! Since the kids were moving around so much during the Pirate Party, I was so glad I did a spot for a photo booth. That way, I actually got SOME photos that weren’t blurry from all the jumping and running! I just used cheap $1 tablecloths in red, white and black hanging on the wall for the backdrop. For the banner, I cut out black and red poster board, taped each to some rope (thought that was more fitting than ribbon), and put skull stickers on them. My wonderful neighbor let us borrow her little sand box for this activity. We filled it with sand, but put some pirate treasure in there for the kids to dig up! You can get simple pirate things such as skull rings, ‘jewels’, or other small items. It helped to have a list of how many of what each child could get, so one person didn’t end up with ALL the rings or jewels! For this one, you’ll need a bunch of empty wipe containers. I spray painted them gold with Rust-Oleum’s Metallic Gold spray paint. 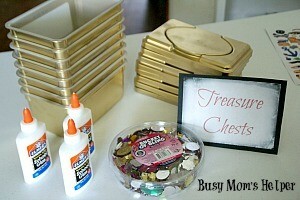 The kids then used glue, glue dots and/or tape to attach jewels to their ‘treasure chests’. They were able to use these to take home some of their ‘booty’ from the digging for treasure activity!If using normal glue, I’d suggest doing this activity near the beginning to allow time for it to dry. Okay, so I know that’s a huge ‘DUH’ activity for the birthday, but I had to put it so I could show you this photo…..THIS was Green Lantern’s attitude for the party! While everyone was singing happy birthday to him, with candles lit on the cake, he sat there with his hand flat over his face. Yup, told ya, MAJOR PILL! 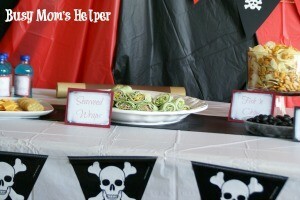 Stay tuned for PART TWO of our Pirate Party, where I’ll share all the decor, fun food and Free Printables! Oh – and the coolest pirate thank you gift EVER: Lollipics! First of all – it’s November. Seriously!!! I still can’t believe that – like I’m in shock or something. Since there’s nothing I can do about it, though….moving on! 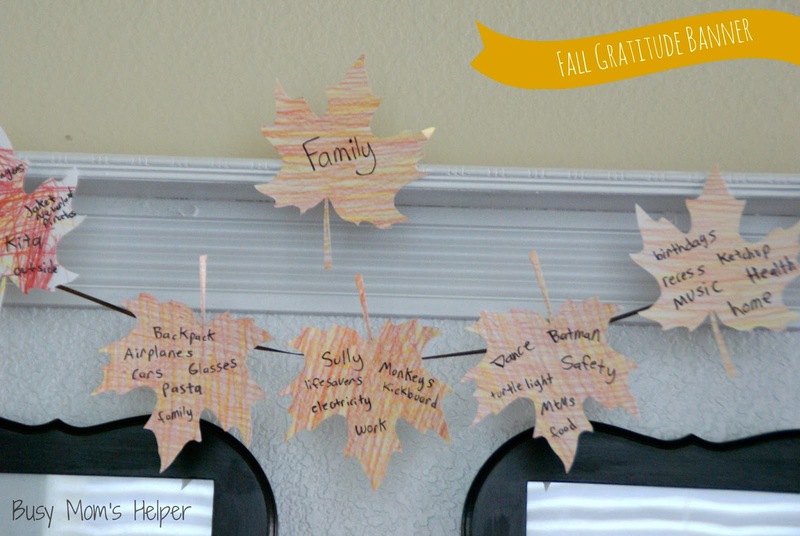 I wanted to have a fun way for our family to count our many, many blessings during this month. I know you should show gratitude year-round, but I wanted to ESPECIALLY focus on it this month. 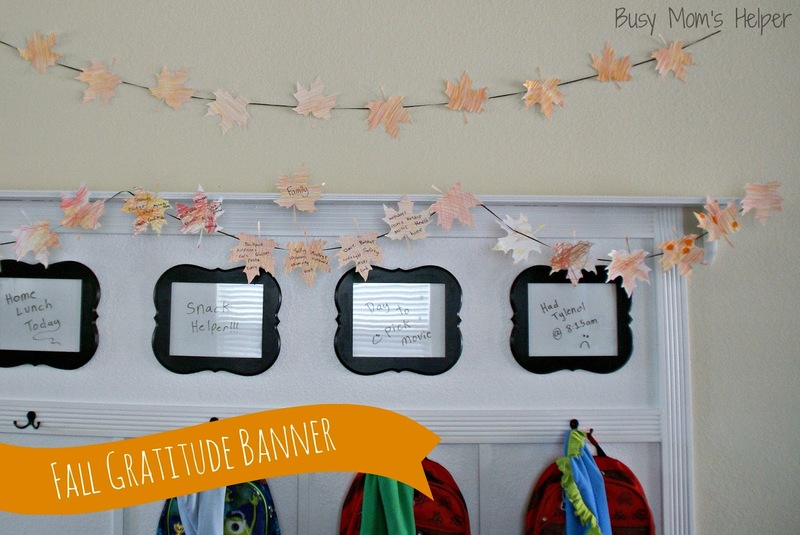 I decided a fun way to do it was a Fall Gratitude Banner. 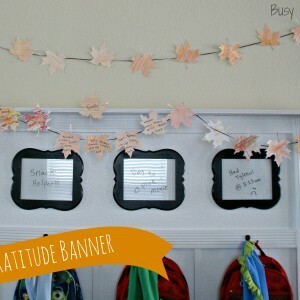 Colorful maple leaves where we can each write one thing we’re grateful for every day of November. It also helped decorate my Backpack Center! Then I let my kids each have a page to color. Can you tell which leaves in the photo at the top my kids did? I did the rest. We used yellows, oranges, reds and browns to create that beautiful Fall color of leaves. After cutting them out (this was the not-so-fun part), I taped each one along the ribbon and hung it over and on the shelf of the backpack center. 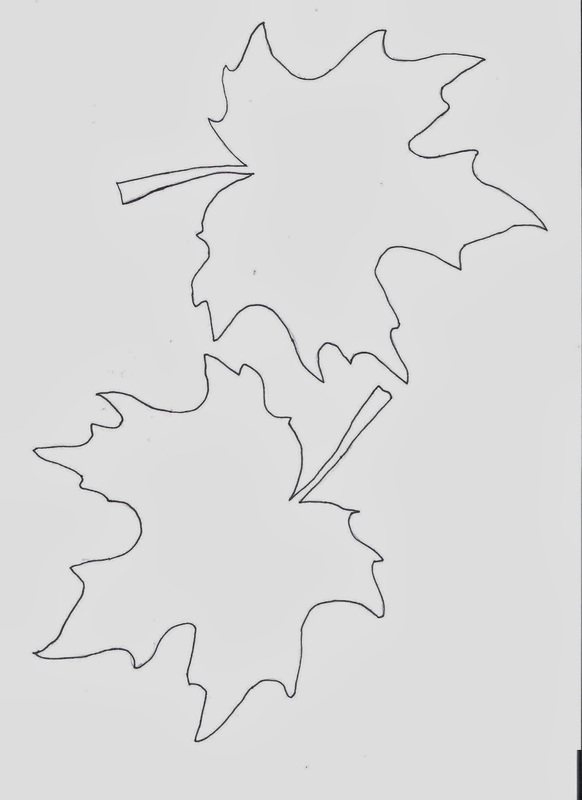 Now, for each day in November, we each say one thing we’re grateful for and I write it on one leaf. So thirty leaves = 30 days = 30 things to be grateful for (times 6 people, that’s a lot of gratitude)!